Y’all know celebrity chef Cat Cora. 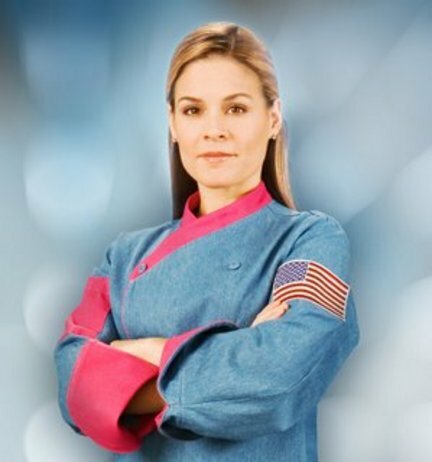 Cat Cora is Food Network’s first female Iron Chef, the brains behind restaurants Ocean by Cat Cora and Cat Cora’s Kitchen. 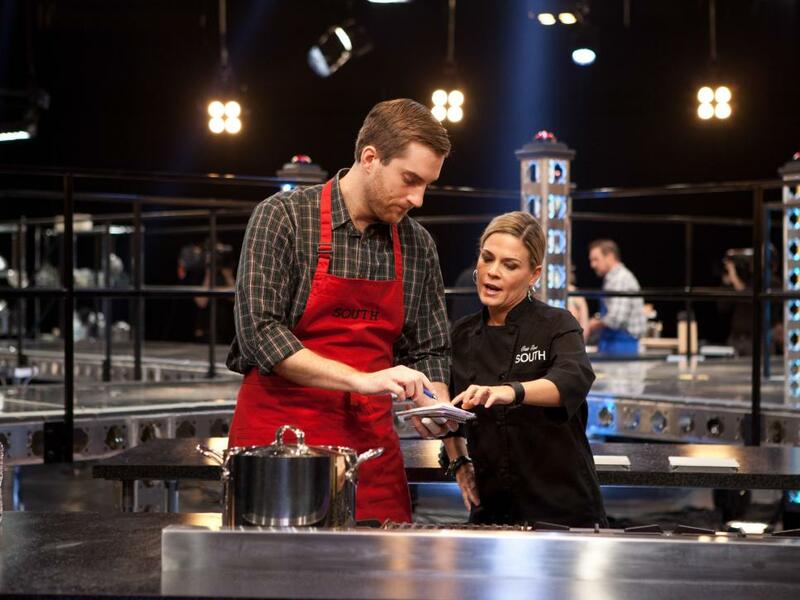 She’s half of the hosting team on the upcoming Fox series My Kitchen Rules, which takes her and co-host Curtis Stone (Top Chef Masters) to Hollywood to judge celebrities’ cooking skills. Cat is also the 2017 Honorary Chef at Atlanta Taste of the Nation, a fundraiser to benefit No Kid Hungry. Y’all know Cat, but you don’t know her like Atlanta Supper Club founder Ben Portman knows Cat. Ben knows Cat as his celebrity chef mentor. 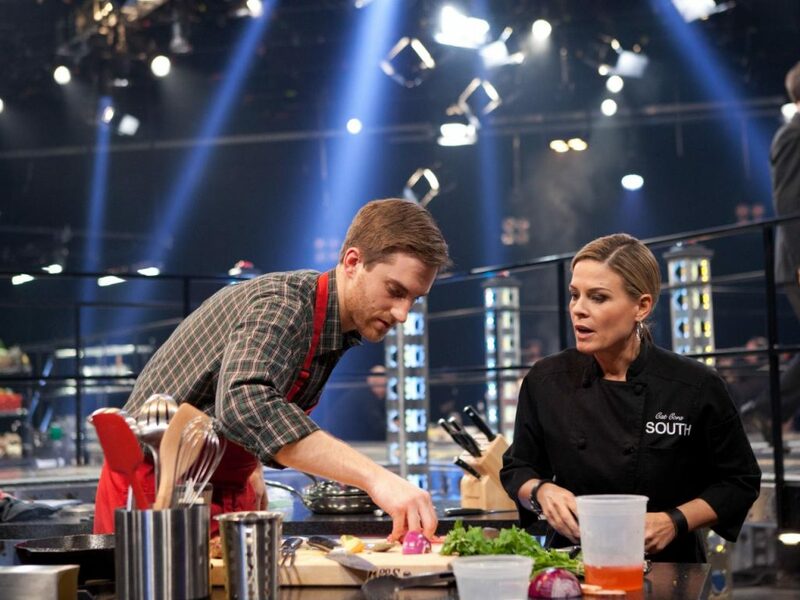 The leader of Porkman’s Table, Ben appeared on the 2014 Food Network show America’s Best Cook, competing in Kitchen Stadium on Cat’s Team South. 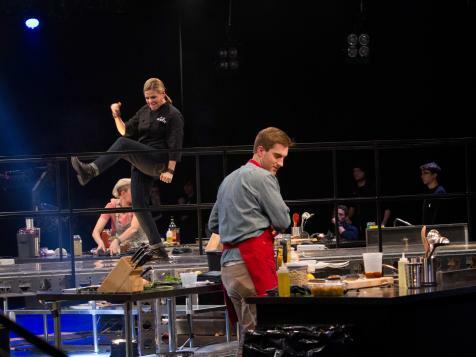 Over the course of one month, he competed against 15 other chefs from across the country with their mentors: chefs Tyler Florence (Team West), Alex Guarnaschelli (Team East), and Michael Symon (Team North). In honor of Cat’s upcoming visit to Atlanta, we sat down with chef Ben to talk food (of course), kitchen injuries (really), and what it’s like to cook for an Iron Chef. Pretty Southern: Ben, thanks for talking with Pretty Southern! Tell us about America’s Best Cook. 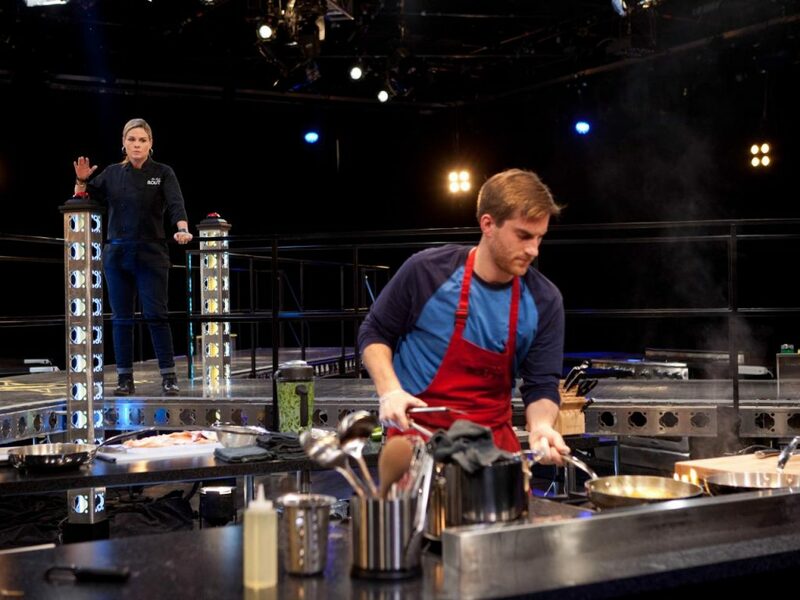 Ben Portman: The way I described the show was, “Almost like the show The Voice, but for cooking.” There were 16 contestants brought in. We did not know the format of the show, we had no idea what to expect. We knew it was cooking and we knew we’d be competing. That was it. Halfway through the first day, they announced to us on camera that we were going to have mentors, announced who they were, and we met them for the first time. The general consensus from everybody was that we were just flabbergasted. These were people we had idolized for our whole lives! I mean, I had grown up watching Cat Cora on Iron Chef, and all of a sudden she’s standing next to me and going to be my mentor. PS: That is so intense! How did this even get started? When did you start cooking? Ben: I started cooking when I was a little kid – I just cooked with my mom. That was something we just did together because when she was home, she was always cooking and I would just spend time in the kitchen with her. We went on vacation, and I saw one of the omelette bars on the end of the buffet line for breakfast, and I just thought that was the coolest thing in the world watching them flip the omelettes. My mom had “taught me” how to make breakfast for myself so that I didn’t wake her up. I decided, instead of peanut butter and crackers that she thought I was capable of cooking, that I was going to make an omelette. After sufficiently destroying our kitchen, I was successful and made an omelette. I surveyed the damage I had done, realized I was in a lot of trouble, and decided instead of eating the omelette, I would give it to my parents as breakfast in bed. They were so touched and moved that I made them breakfast in bed, and they couldn’t believe how great their son was, and then they came into the kitchen and realized exactly what the motives behind the breakfast-in-bed move were because I had absolutely made a mess of everything. PS: Now you run Porkman’s Table out of your house, possibly destroying your own kitchen. How did you start the supper club? Ben: When I got to Atlanta, I had pretty much stopped cooking in restaurant kitchens in favor of another career. I ended up realizing what the underground food scene in Atlanta was like just by seeing those who had done it before me and decided that was something that maybe I could pull off. A few friends of mine and I were, I guess, ambitious enough or foolish enough to think that we could do it, and just put up a website. We started sending emails to people that we knew that we were going to throw a dinner, and there was a suggested donation. A few publications picked us up, Urban Daddy wrote about us as well as several others, and all of a sudden it became real. Strangers started showing up to our dinners. We donate all of our profits to charity, and at this point now instead of doing weekly dinners, we do monthly dinners that are auctioned off at Atlanta charities. PS: How did running a supper club in your house translate into being on a Food Network show? Ben: And I said, “Probably not.” So I talked to the folks at work, and luckily they were extremely generous and extremely flexible with me and my schedule, and let me go to New York to film the show. I ended up being there for three and a half weeks, so pretty much the whole time. PS: Cat is coming to Atlanta for the Taste of the Nation benefitting No Kid Hungry on April 20. You knew of Cat from when she was on Iron Chef. What was your impression of her before you met her? 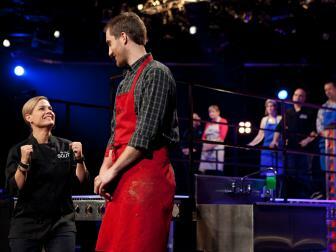 Ben: Cat was always one of my favorite people to watch on Iron Chef because she had such an incredible focus in the kitchen. She was such a spark plug with her cast of cooks on the show, and you could just see that she operated and was thinking on a different level about food, but then also was able to not lose sight of the fact that food is supposed to be fun. Even just finishing her dinners, she would finish cooking with her signature shot of ouzo – she kept it light at the same time. She is a badass cook. It’s very hard, especially when she came up in the industry, to make a name for yourself as a woman chef because it’s such a male-dominated industry, yet she just bulldozed through it and took no prisoners. She became my mentor, and all the mentors are great and are giants in their own right, but she is absolutely the person that I would say I looked up to the most, even though she was the shortest mentor. PS: It sounds like the moment when you actually met her was kind of hectic. Do you remember what you said right when you met her? Ben: When I first met Cat, there wasn’t a lot of opportunity to say much other than brief hellos and pleasantries. She, of course, was extremely warm and welcoming and excited. About that same time, we found out that we’d be cooking for our lives [in Kitchen Stadium], so we were also deer in headlights. Realizing that we just met this person who we have watched for years, and we may be going home in an hour. We didn’t know what we’d be cooking, we didn’t know how it would all work, and it just was a very nerve-wracking experience. I remember meeting her, and thinking about techniques that I saw her do, or learned from her, or basic flavor profiles that I remember her valuing. I had a feeling it would be something Southern. I knew she was from Mississippi, so I just tried to figure something out that may be Gulf Coast-oriented. You know, what people don’t realize about Southern food is it’s in large part a study of vegetables. So, thinking about how she treated all of those things with such respect, and used every bit of every product she could and had no waste…but really I was just a total mess, and I had no idea what I was doing. PS: The idea at the beginning is that there are four people vying for spots on each region team, and then Cat picks out who she wants to have on her team. AND Ben has a special message for Cat!